The new Extreme Weather Simulator from Channel One News offers educators an exciting way to teach students the science behind our planet’s deadliest storms. Educators can share the Extreme Weather Simulator directly with students via the Google Classroom share button. It’s the perfect start to further exploration of extreme weather and natural disasters. The Extreme Weather Simulator world map leads students on a tour of some of the most devastating blizzards, tropical cyclones and tornadoes. A click on each icon takes users to key information about historic storms around the world. The brief overviews are a great start for students deciding which event to investigate further. In addition to the interactive map, students and teachers can click through the tornado, cyclone and blizzard simulators, and get an overview of how each storm forms. Students can turn up the dial on the Enhanced-Fujita Scale tornado classification, and manipulate the speed and width of a tornado funnel. With the tropical cyclone simulator, students can whip up the winds and grow the storm to imposing diameters. In the blizzard simulator, users can increase windspeed, wipe out visibility and drop traffic-halting amounts of snow. Students will learn what it takes to take a storm from light snowfall to full-fledged blizzard. 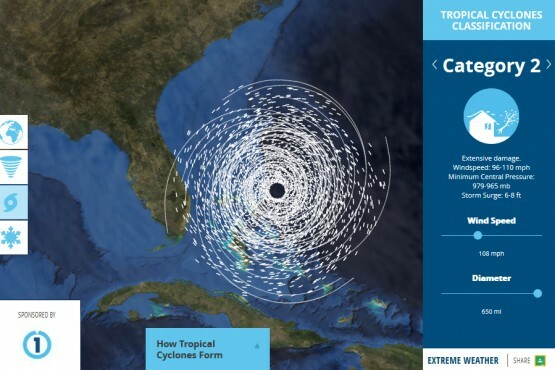 Whether it’s the season of winter storms, tornados, or hurricanes, cyclones and typhoons, educators will find the Extreme Weather Simulator will hook kids on the science behind what’s happening in their world. that looks cool but storms are very dangerous. what dose it do other than the weather? This is pretty cool TBH! Awkard scene: Your friend Sandy reccomends this to you. More awkard: Your name is Katrina.